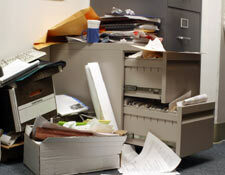 Looking for office clearance Redbridge? We all know moving home is hard work but moving offices can be just as big a challenge. The amount of clutter that can accumulate over the years is astounding and quite often, it’s difficult to know where to begin! If this sounds familiar, or if you’re simply planning a good clear-out, it may be time to call in the professionals and talk to us about your requirements for office clearance Redbridge. We are fully licensed, insured and WEEE compliant so you can confident any waste will be disposed of legally and responsibly. Using our office clearance service couldn’t be simpler. Just call us and book an appointment. We will visit your premises and give you a quote there and then and if you are happy we will crack on. You will barely even notice we are there but you’ll certainly notice we have been! We offer competitive prices and can even show up on the very same day you book us. We won’t leave until the job is done, including sweeping up any mess left behind. We always show up when we say we will and will even give you a quick courtesy call to confirm the appointment, just in case you forget. If you want to know more about our services or discuss your requirements for office clearance Redbridge, phone us today on 020 8504 7390 or 07957 123 019 . Our experienced team will be happy to answer any questions and recommend the most cost effective solution. Or you can also use our easy online request a quote form and we’ll get back to you quickly.